Your tour of the year's newest ideas in automobiles begins here! For this is the story of the twelve new models and four great series of the 1960 Meteor-a car that in a few short years has become the fourth most popular automobile made and sold in Canada. And now for 1960, Meteor presents its newest ideas ever. Starting with the clean, sculptured styling illustrated above, you'll discover wonderful improvements in riding and handling, performance, economy, comfort and convenience. 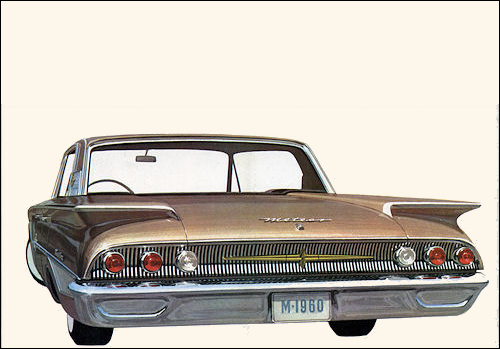 In every respect, Meteor for 1960 is Canada's idea car of the year. And not only looks it- but acts it! From every vantage point, Meteor is dramatically new, distinctively Canadian. New ideas in economical power are yours in two new Tempest V-8 's and Meteor's famous Econ-O-Fuel Six. Power flows in a smooth stream through either of two automatics or the neatest standard transmission in the country. A choice of twelve different drives! Miles fade away and bumps vanish under the absorption power of new front and rear suspensions. The new ideas are many but they all share one basis. Everything you discover in Meteor is new for a purpose. And the purpose is your driving pleasure. Want to drive an adventure? Want to capture sports-car excitement and be able to share it with your family? Your answer is here in the 1960 Montcalm convertible, outdoor example of Canada's idea car of the year. You'll welcome the new mechanism that swiftly lowers the all-vinyl top and folds it neatly from sight leaving a smooth, clean-flowing line. At highway speeds, notice how Meteor 's top doesn't balloon. It's anchored to seal weather out and pleasure in. Interiors are weather-proof all-vinyl and tops come in two smart colours: white and black. The Montcalm "welcome mat" is actually carpeting from wall to wall. Its deeply cushioned seats are three-adults wide and at a comfortable height. Its roofline is styled in the trim, tapered lines of modern architecture. Here indeed is the finest example of the new ideas so abundant in the 1960 Meteor family. Such ideas as-new Short-Stroke V-8 and 6 power. .. new cushioned ride.. . seventeen new, time-resisting colours. .. new styling distinction. .. new brakes (the largest in Meteor's field).. . a new, more efficient cross-flow radiator. New ideas all-for you-in Meteor 1960. With windows up, this beautiful new Montcalm four-door sedan looks for all the world like a hardtop. Concealed centre pillars and the classic Montcalm roof provide this luxury look as standard equipment , in the year's most idea-filled sedan. Here's room for stretching legs. New head room hats considered!). New shoulder room. Here's room for six to ride in uncrowded comfort. And convenience features that make the longest journey fun. Here's the car that says "let's travel! "-and says it so well that the miles melt away with the sheer enjoyment of driving. So new is the originality in 1960 Meteor styling that out of the four cars in the classic Montcalm series, there are three distinctive roof stylings! Here in this special Montcalm two-door hardtop is one of the most exciting. A fast sweep of metal atop more than 5,000 square inches of safety glass identifies this Montcalm at a glance. An inch lower than other Meteor models, the Montcalm two-door hardtop has generous head room and wide new doors that permit easy entry. New compound windshield provides 55% greater visibility. All around you is the unhindered view of a "top down" convertible. To look at the unified cleanness of design in this Rideau 500 four-door sedan, it's hard to imagine that more than 17,000 parts must combine to achieve this unity. .. this look of tomorrow. In the 1960 Meteor, after much research, a major step forward in body-frame assembly has resulted in a solid car with remarkable structural strength. Heavier, longer frame and the most thorough insulation in Meteor's field, makes this a car of quiet precision. You can talk in whispers and hear. This is the sound of tomorrow-the hushed pleasure of Meteor quality quiet. There are many more new ideas to look for in the 1960 Meteor. Here are just a few of them. Meteor's new brakes are the largest in its field-25% larger. A touch brings you to a straight, controlled stop. There's no see-saw on braking, either. Meteor's new self-levelling suspension prevents nosedive on sudden stops and rear-end squat on acceleration. Wheel treads are fully five feet apart for greater stability. Meteor's new steering is precise-with a high 27:1 ratio that operates with ballbearing smoothness. The most petite of drivers finds every Meteor finger-touch easy to control. 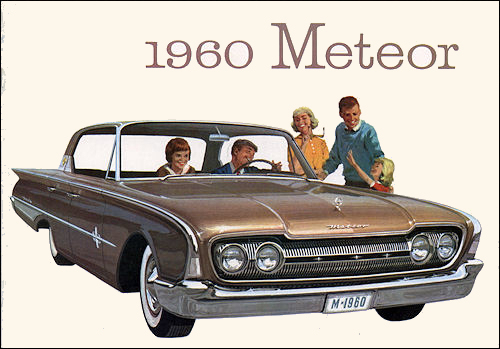 For 1960, the Rideau models are the lowest priced in the Meteor family. It's hard to believe. Styling is Meteor-new and distinctively Canadian. The look of this car is the look of originality. New, lustrous enamel -in 17 glamorous finishes will stay beautiful for years. Standard Meteor engines, 6 or V-S, purr best on regular grade gasoline-and save up to five cents a gallon. New full-flow oil filter permits driving up to 4,000 miles between changes. All savings you can measure. But the finest measure of Meteor is the way it adds to the pleasure of driving a car. Your first day with this six-passenger beauty is a day of discovery. If it happens to rain you'll like the new longer wipers that sweep a 33% greater area and do it faster. Comfort is apparent immediately. Seating is at a comfortable height with foam cushioning as standard equipment on all front seats. A flatter floor design permits comfortable leg room , even for the "middle man ". And gone for good is stubborn seat adjustment. Front seats ride on ball bearings and adjust to eleven positions at a touch. The 1960 Meteor tailors itself to your needs as if it is made for you and you alone. 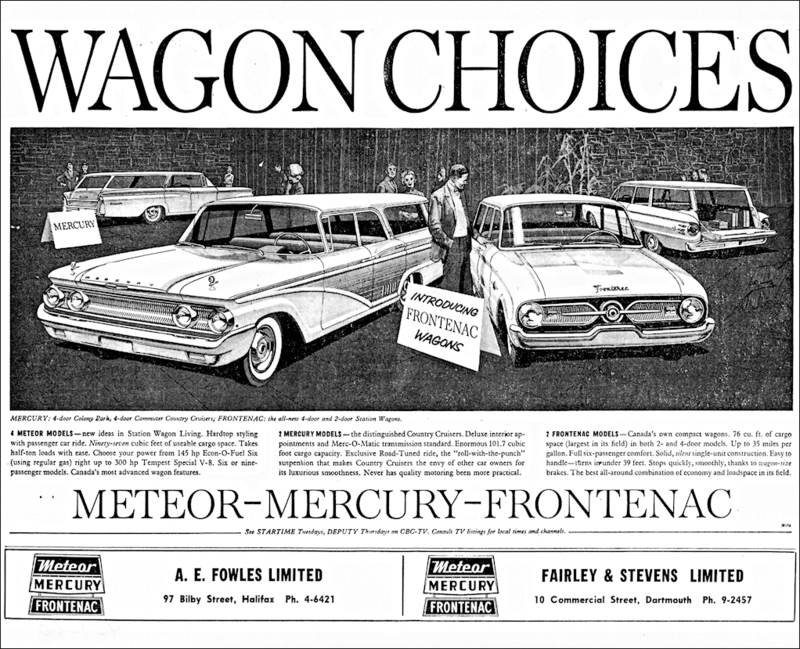 Four major ideas stand out from the dozens in Meteor's 1960 quartet of station wagons. Hardtop styling! Rear seat comfort! Half-ton loads! And passenger-car ride! If ever wagons were made to match your every mood, here they are. They'll pack a hunting trip on the weekend-and take you to work on Monday in limousine comfort. They'll transport a crowd with ease. Or haul eight-foot lengths of wall panelling (even longer, if you lower the tail gate!) With V-8 or 6 power, you'll get top economy while enjoying the year's newest ideas in station wagon living.